SIHH 2013 came and went in a blur...this was one of my busiest SIHH in my 12 odd years of attending yet. And one of the most interesting for my friends at Lange. Big, big crop of new watches. 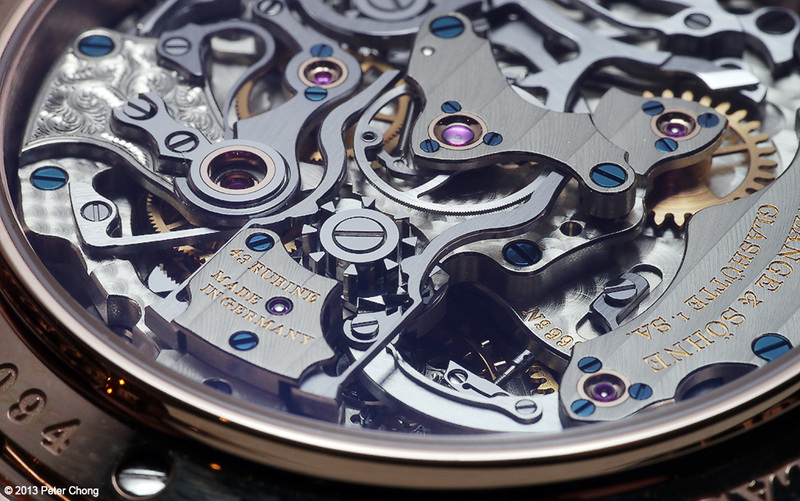 Grande Complication, 1815 Perpetual Rattrapante, 1815 Up Down, Lange 1 Lumen, amongst other new case/dial combinations. Interesting, when many other houses are slowing down on new movements. I start my report with my favourite novelty of the year. The 1815 Perpetual Calendar Rattrapante. 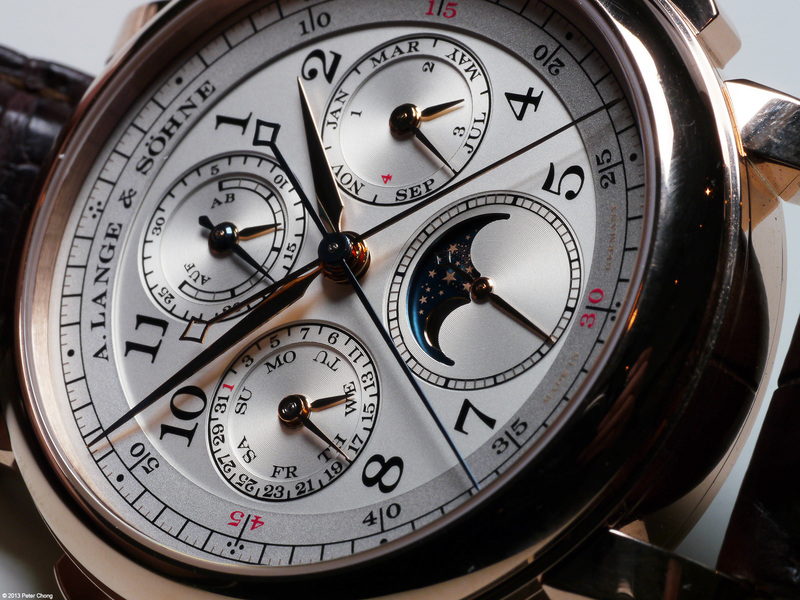 Some may ask...why not the Grande Complication? Well, it could be a favourite...but as of now, its in teaser stage...while I did see and hear the beautiful watch...magnificent sound, you'd have to trust me on that for now...no photography is allowed of the Grande Complication as SIHH 2013 is viewed by ALS as a teaser for this magnificent piece. Will have reports later in the year. Also, the 1815 Perpetual Calendar Rattrapante (1815 PCR) is magnificent, most beautiful, with a gorgeous movement, and an interesting price too. €160k for the gold, and €180k for the platinum...German retail. 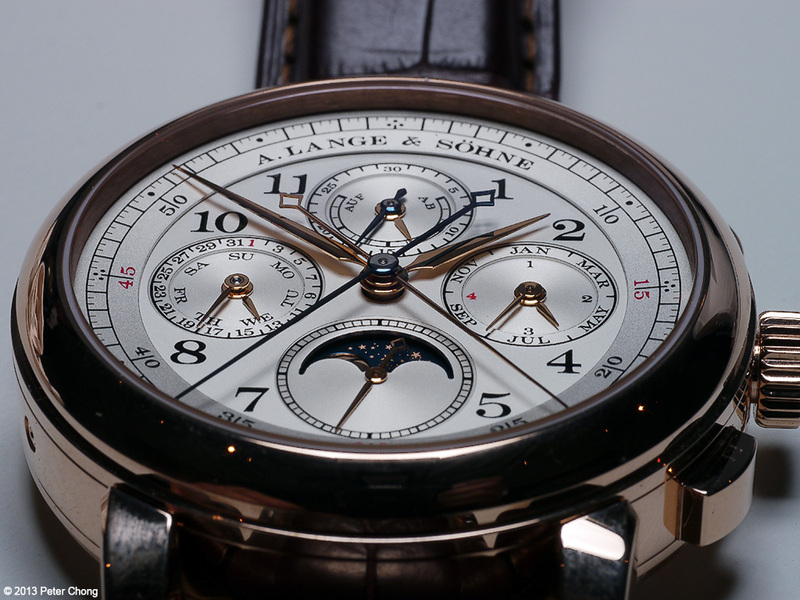 Some €60k lower than the comparable Patek Philippe offering - the 5204. I leave you to browse the specifications at the official Press Releases elsewhere, and comments posted by my co-conspirator Edwin Heusinkveld here. 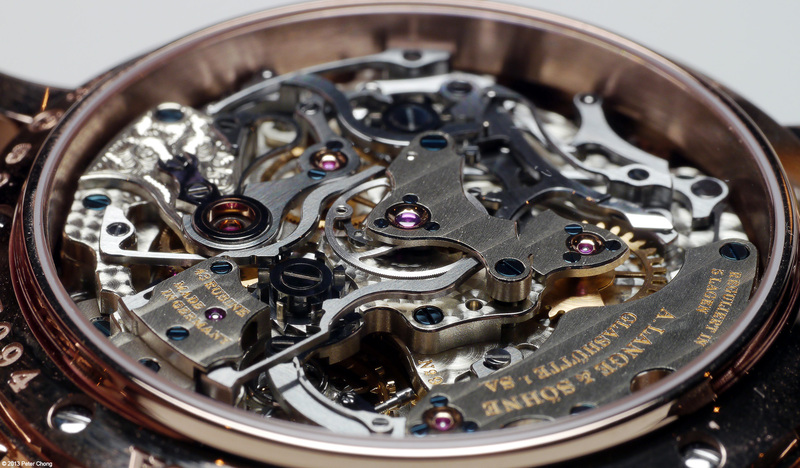 And as usual, I will only show my own photographs of the watch(es) and my personal comments. 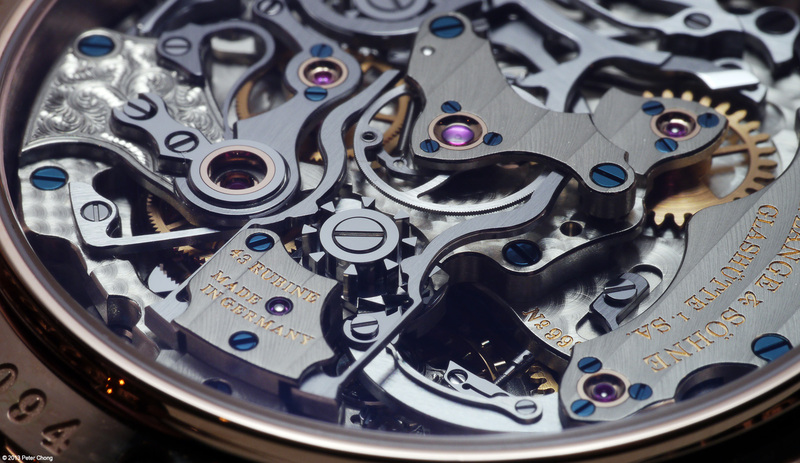 The dial is magnificent. Most beautiful. Everything is nicely laid out, though a traditional perpetual calendar with a 4 year layout, the dial is legible in light. This is not a night vision watch as it does not provide for superluminova or other low light assistance, but as this is a high end luxury timepiece, its not only ok, but more desirable as the lack of superluminova makes for a more elegant design of the hands and numerals. Also a perpetual with glowing indicators will be too busy. I do consider the dial to be a triumph in design and execution, and I am a bit undecided myself, but may have preferred a bit more profiling...my own humble suggestion is to use applique roman numerals for the hour indicators in the same material as the case. 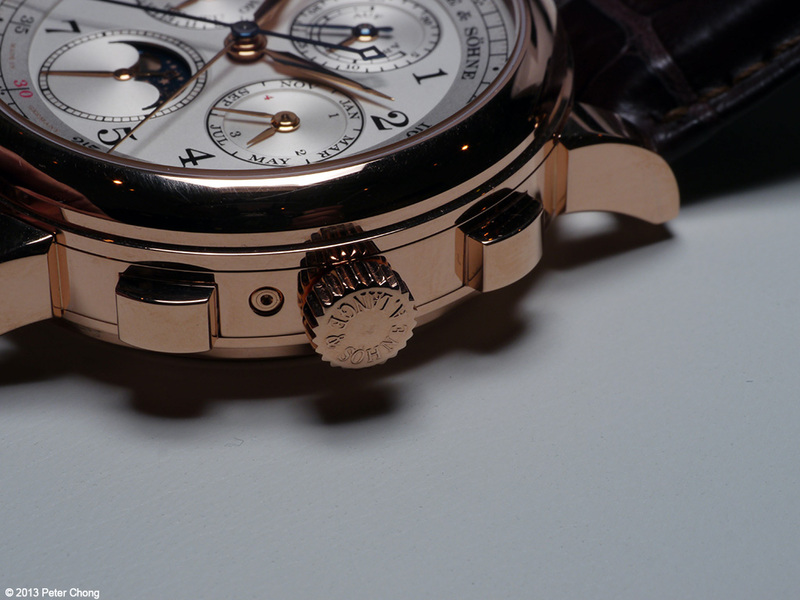 Of course this would change the character of the watch completely, for one it will no longer belong to the 1815 family with arabic numerals on the dial, but perhaps just gold/rhodium bar markers like those in the Pour le Merite Tourbillon in rose gold with a black dial showed the way many years ago. I wonder. The movement is busy, complicated...as a split second chronograph should be, magnificently finished. Sparkling at every edge and anglage. Polished, spick and span. Beauty personified. 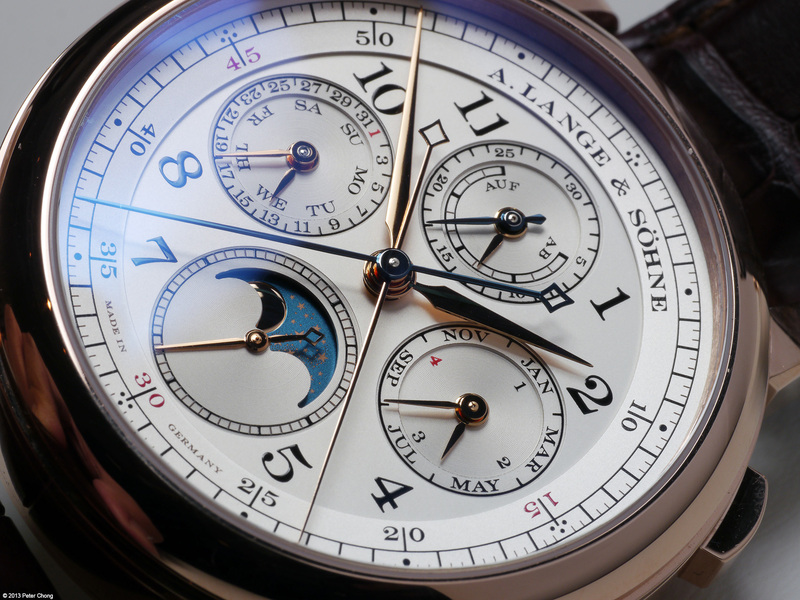 The layering achieved by Lange is remarkable. This is a fully integrated, all new split second chronograph works, I understand loosely based on the Tourbograph, but redesigned. 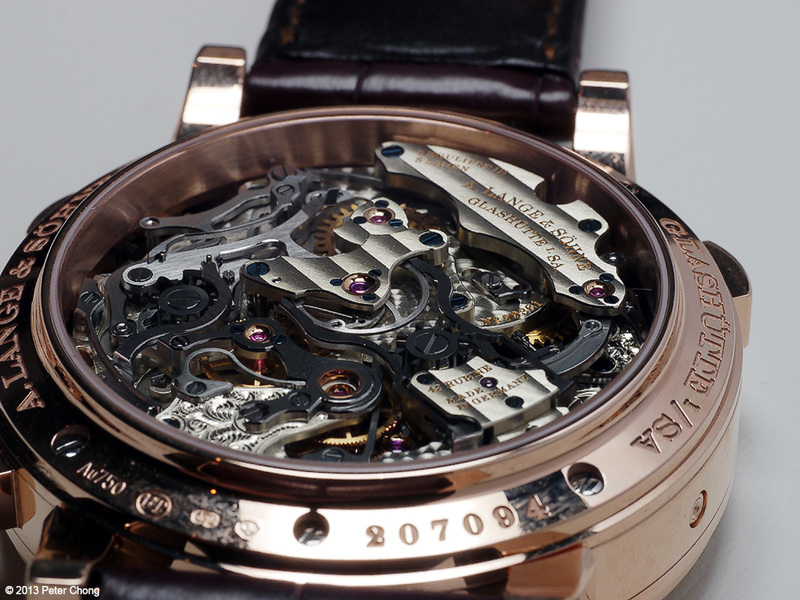 The dual column wheels, the scissors jaws of the split second arresting mechanism. All flawlessly designed and beautifully executed and finished. A pure joy to behold.